Ms Caroline Gauci is a Regulatory Advisor within GANADO Advocates’ Banking and Finance team, assisting banks and financial institutions extensively on various regulatory matters. 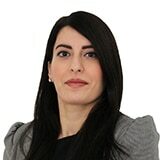 In particular, she advises the firm’s clients on the licensing regime in Malta applicable to credit institutions and financial institutions, including on-going compliance with the various legislation applicable to payment services, electronic money and general banking activities. Caroline also assists clients in general corporate matters including corporate governance. Caroline has over 10 years banking experience working within the Banking Industry and with the MFSA. Caroline also forms part of the firm’s Investment Services and Funds team, focusing on the setting up, procurement of licences and ongoing servicing of investment service licence holders and collective investment schemes, and also regularly assists the firm’s clients with other regulatory matters. Ms Caroline Gauci is a Regulatory Advisor within GANADO Advocates’ Banking and Finance team.